Each month, we offer a variety of activities at the large tables in the Center for Creative Connections gallery. Each activity is related to a nearby work of art. One of my favorite new activities is coil basket weaving, inspired by the storage basket, bowl, and burden basket created by weavers from the San Carlos Apache tribe. Storage Basket, Apache peoples, c. 1880, Dallas Museum of Art, gift of Lillian Butler Davey. Bowl, Apache peoples, c. 1880, Dallas Museum of Art, gift of Lillian Butler Davey. Burden Basket, Apache peoples, c. 1880, Dallas Museum of Art, gift of Lillian Butler Davey. The actual materials used to create these baskets–devil’s claw, willow, cottonwood, and buckskin–are natural resources found in the Arizona region where the tribe resides. To make the materials more pliable, they are often soaked in water prior to weaving. The patterns are created by alternating dark and light. Basket weaver Lizette Phillips is in the process of weaving a coiled basket. Notice the raw materials nearby. Photograph by Robert H. Peebles, 1954. In the gallery, we use three colors of raffia ribbon to create our coil baskets. Red is easily distinguishable, so these strands create the basket core which will be covered during the weaving process. Then tan and black raffia are used to wrap the core and create patterns. For your basket core, cut the red raffia into ten 24 inch long strands. Choose a tan or black strand of raffia and wrap it tightly around the red basket core strands. Cover about two inches of the red basket core, then begin to spiral the wrapped end inward. Continue spiraling so that the wrapped strands resemble a snail shell. Take the end of your tan or black raffia strand and loop it through the spiral to secure the basket center. Continue to wrap the red basket core. Each time you cover a few inches of the red basket core, thread your tan or black raffia through the most recent coil to keep the coils connected. If you want to switch colors, cut a strand of the alternate color. Line your new strand up as if it was part of the red basket core. Secure the new strand by wrapping it a few times with the old color strand. Let the old color strand become part of the red basket core, and use the new color strand to wrap around the basket core. Continue wrapping the basket core, securing the newly wrapped coil to the previous coils every few inches. Once you get the coil weaving technique down, think about experimenting with other materials. The Apache weavers used devil’s claw, willow, cottonwood, and buckskin because they were plentiful resources. What kinds of resources do you have at your disposal to weave? The DMA is so happy to continue our partnership with DART for this year’s DART Student Art Contest. Students in Kindergarten through 12th grade are invited to submit an 11×17 poster with their most creative vision of this year’s theme, DART to Discovery. Visit DART’s website for complete rules and details. The contest deadline is Leap Day, February 29, and we’ll host the winners for a reception at the Museum in April. So encourage those little creative minds to get to work–we can’t wait to see their posters! Despite harsh weather conditions this past Monday evening, Educators Night Out saw great success! Teachers were invited to enjoy International Pop and Jackson Pollock: Blind Spots for free, along with snacks, drinks, tours, and a photo booth. The “Poptinis” and tiny cake pops were delicious, and the Pop-themed photo booth was a hit! We made some new friends, and caught up with a few old ones too. We loved seeing all the awesome teachers in our galleries, and can’t wait to see you again soon! Let’s consider the proverbial elephant in the room: many school districts, including Dallas ISD, are in need of community help, be it as informed advocates or active participants. Often, those of us outside the intricacies of the district itself feel helpless to initiate assistance, or to even know where to start. It was this realization, along with a desire as both a museum educator working with teachers and a parent of a DISD student, that led me to apply to be a fellow in this year’s Leadership ISD program. To be accepted into the program and participate this year has been an immensely rewarding, heartening, and humbling experience. Helmed by Patricia Arvanitis and an amazing group of staff and volunteers, Leadership ISD is a non-profit organization dedicated to fostering knowledgeable citizen advocates for the Dallas Independent School District, ultimately serving as a growing group who can help all students achieve and thrive. 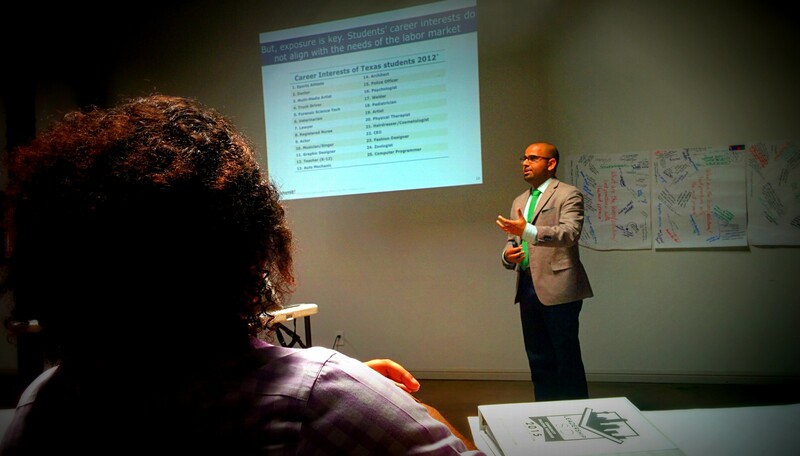 From September through May, we forty-two LISD Fellows attended a series of monthly seminars each focusing on a different issue DISD schools and students face, including the opportunity gap, early childhood education, and buildings and facilities. Those may sound like dry topics, but the activities and conceptualizing that went into each proved to be fascinating. For the training on buildings and facilities, we began the day in groups charged with this question: what would an ideal school look like? 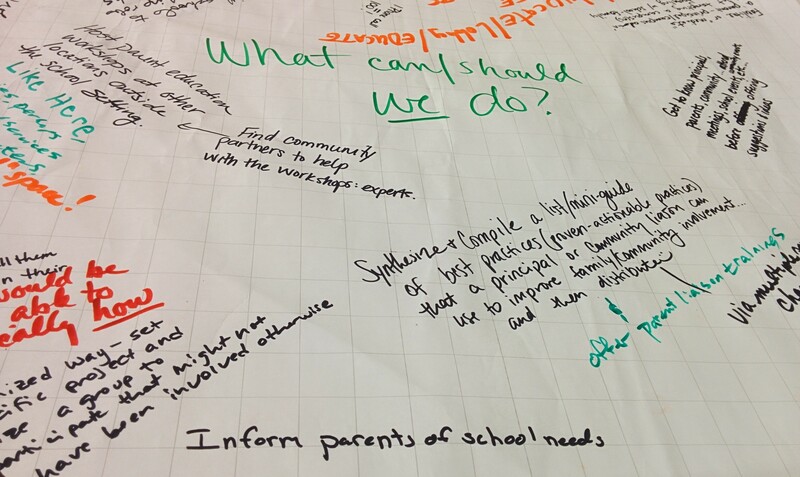 As each group brainstormed and later shared their ideas, it became clear that our approaches focused on different ways of tackling the idea: one group considered what might be done with the empty school buildings already owned by DISD, while another group considered a perfect school developed around different educational models. One of the benefits of being part of the Leadership ISD is hearing from an array of knowledgeable voices. As part of our monthly meetings we had opportunities to discuss issues with parents, teachers, experts from organizations like Uplift Education, Momentus Institute, and Teach For America, and key figures like school board members, Superintendent Mike Miles, and Mayor Mike Rawlings. At such times we were encouraged to ask probing questions and critically evaluate whatever data was presented. 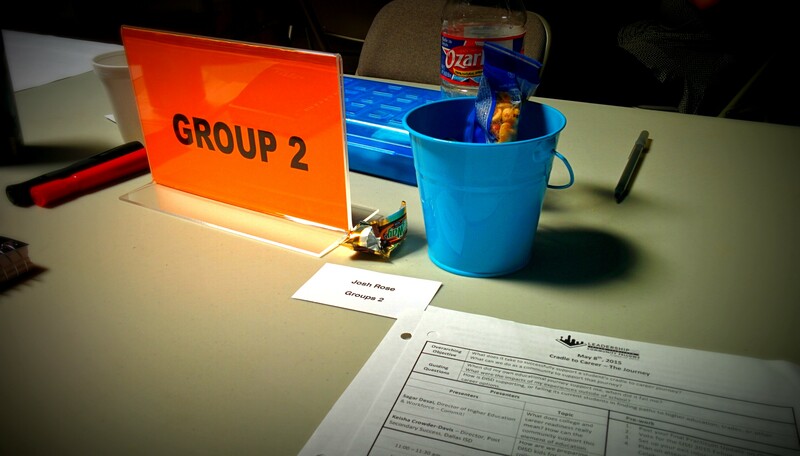 Beyond these monthly seminars, though, was the real meat of being a LISD Fellow. As part of our participation we were required to attend school visits, DISD board meetings, and participate in a Practicum project assigned to a specific school. These “on the ground” activities not only engaged us in a more individual way with the issues schools, teachers, and students are facing, but empowered us to create active and ongoing results for all involved. As our year has wrapped up, two different things have been dominating my mind. First, after almost every seminar, meeting, and practicum discussion I was involved with, I always walked away with the sense that the issues schools, teachers, and districts are facing are immensely complicated. There are no easy solutions. The more I learned, the more complicated each topic appeared. Yet, this feeling was always tempered by an extreme sense of hope, of participation as a step amid these complicated issues, to chart a path through them. This second feeling — hope — is one that any of us can have by getting involved and informed. If you are so inclined — and I hope you are — consider applying to be one of Leadership ISD’s Fellows next year, won’t you? The deadline to apply is June 1st! A Round of Applause (and an Apple) for Teachers! This week — May 4th through 8th — is National Teacher Appreciation Week. Originally designated as National Teacher Day in 1953 through the efforts of Eleanor Roosevelt, the holiday became a nationally recognized day in 1980, then extended to a full week in 1984. We have many different types of teachers here at the Dallas Museum of Art, ranging from Education staff, Docents who give tours, and trained volunteers who lead programs off-site as part of Go van Gogh®. We wanted to take a moment to thank all of our many wonderful teachers, and share some photos with you of a few of them at work. 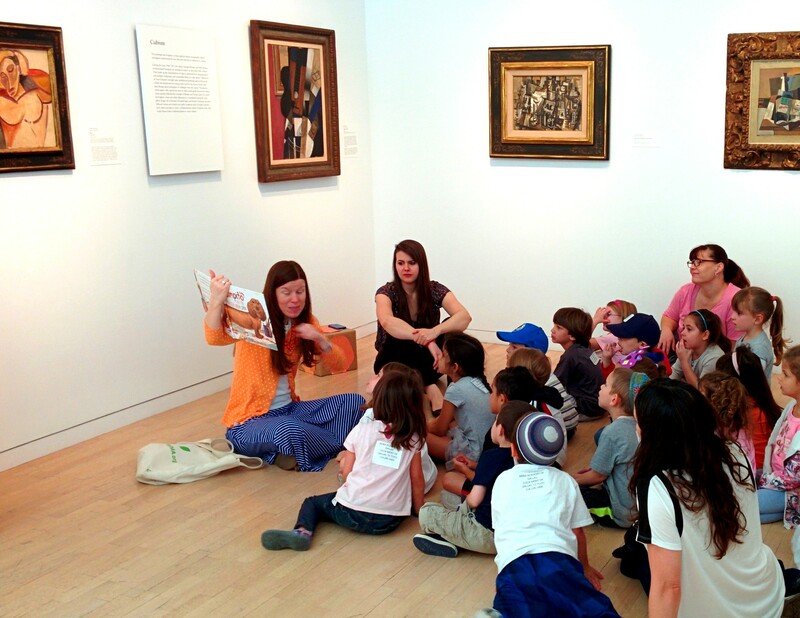 Leah Hanson, Manager of Early Learning Programs, reads a story to Pre-K children in the galleries. 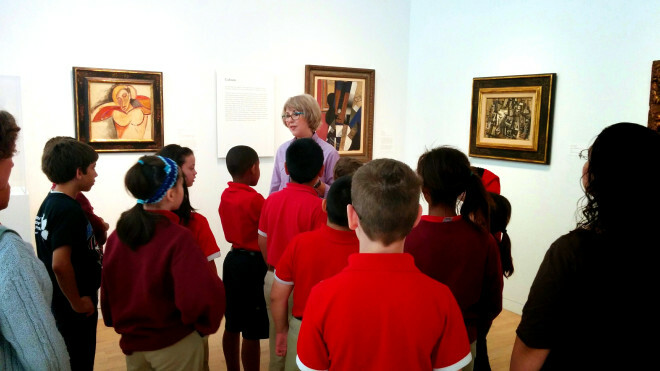 DMA Docent Carolyn Harris captivates a group of fourth graders during a school visit. 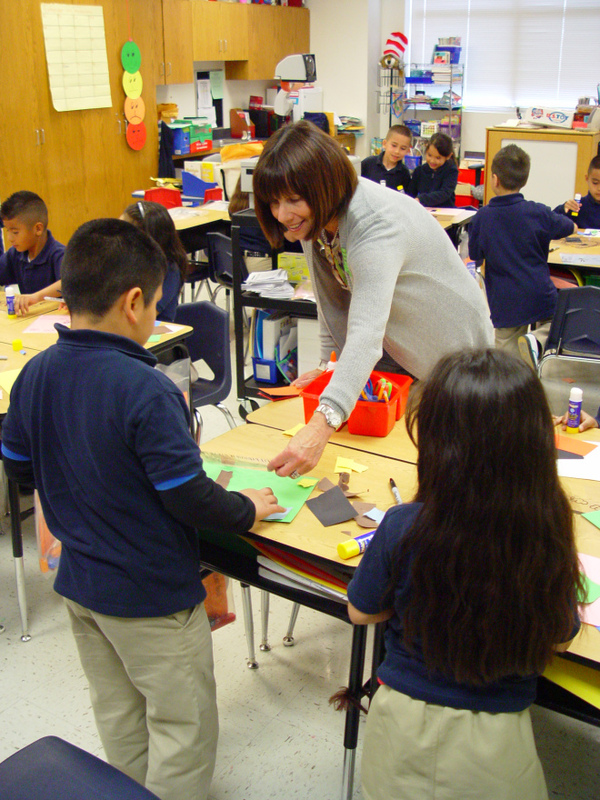 Go van Gogh® volunteer Karen Wyll leads a hands-on activity at Rosemont Elementary. Teachers make such a huge impact in our lives and in the lives of our children. Take a few moments this week to recognize that special teacher who has touched your life, or who brightens your child’s each day. A handmade creation is always a perfect way to say thank you–make a paper flower bouquet or check out this list of other fun thank you DIYs to try!